The ITM Fishing Show host Matt Watson says shark finning is a disgusting practice and is calling on the government to ban the practice in New Zealand. Earlier today, Matt Watson helped launch a campaign by the newly-formed New Zealand Shark Alliance (NZSA) at Kelly Tarlton’s Sealife Aquarium to encourage New Zealanders to support their bid to ban shark finning on our waters. Global shark populations have plummeted over the past 50 years, and the estimated 73-100 million sharks caught every year only for their fins, is contributing significantly to the decline. Ninety-eight nations, including Australia, Canada, Ecuador and members of the European Union, have already banned shark finning. New Zealand is not one of them. An NZSA spokesperson from Forest & Bird Katrina Subedar says New Zealand’s legislation, which bans finning of only live sharks, is shamefully out of line with the rest of the world. The shark finning industry is driven by high-market prices from Asia where the fins can fetch prices up to $1200 per kilogram, making it one of the world’s most expensive seafood items and a lucrative catch for commercial fishers. The Ministry for Primary Industries is currently reviewing the National Plan of Action for sharks, which outlines fishing management strategies for the conservation and management of sharks and their long-term sustainable use. An NZSA spokesperson from Greenpeace, Karli Thomas, says now is the time to act. Matt Watson says shark finning is the primary cause for the declining number and size of sharks, and he is disgusted the practice is still permitted on our waters. 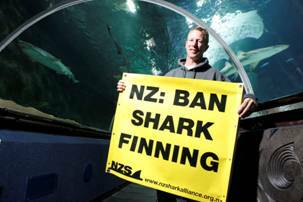 The NZSA is calling for all New Zealanders to voice their support to ban all shark finning. New Zealanders can show their support by signing the pledge to ban shark finning in New Zealand on the NZSA website www.nzsharkalliance.org.nz. Information about making a submission will be available soon.